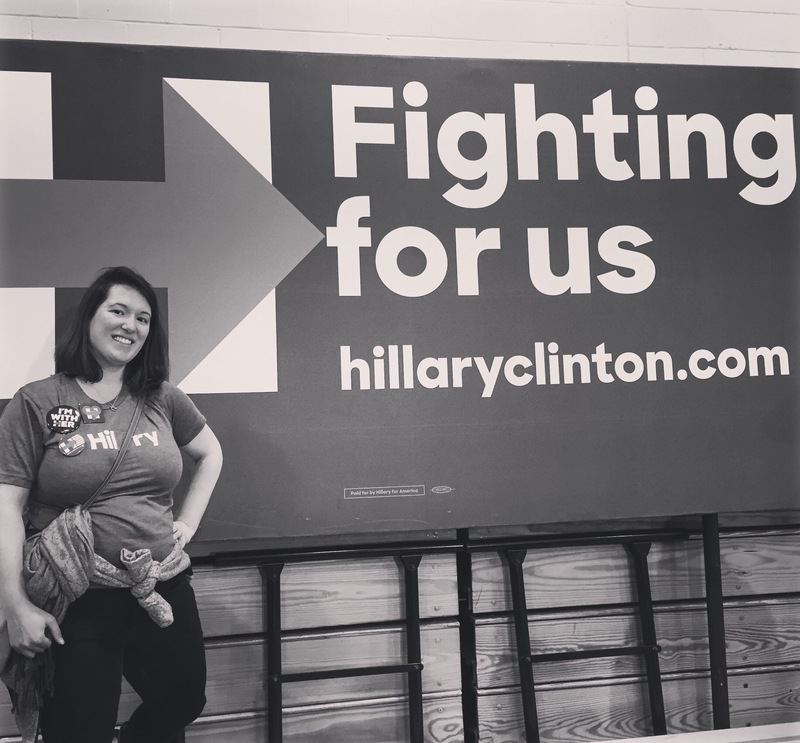 I’ve had the time of my life following this election – meeting Hillary a few times on the campaign trail, buying boxes and boxes of political pins to distribute to my friends, having real meaningful conversations with people about why #ImWithHer. And while there’s a lot at stake here – and a very scary man threatening to use his political power for personal retaliation – there’s still some fun to be had in this media circus. With that in mind, I present this gem – in an alternative universe, these folks might make a good “Dancing with the Stars” team! All eyes are on the small slice of the world that I call my home state. The New Hampshire primary is in four days, and after close races in Iowa – on both sides – things have reached a fever pitch here. Of course, I’m home to get in on the fun. 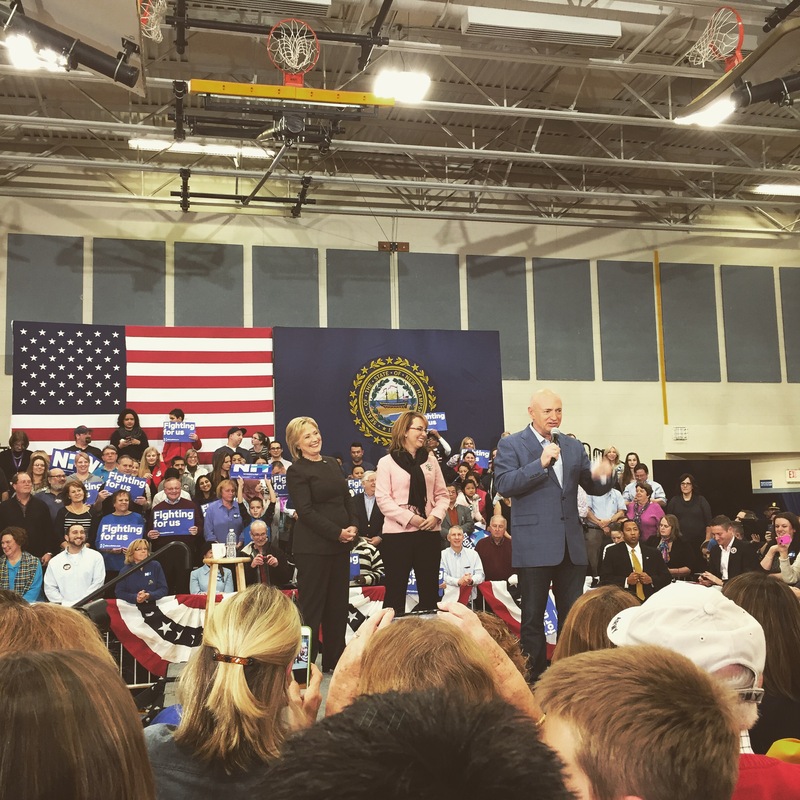 On Wednesday, dad and I trekked out to a local middle school to see not just Hillary, but Gabby Giffords and Mark Kelly by her side. I agree, Gabby, I agree! So this weekend, I’ll be out, walking through the freshly-fallen snow to knock as many doors as possible and convince as many Hillary people as I can to show their support on Tuesday (no matter how cold it may be!). I believe that she will win – and I’m going to put all my energy into making that a reality! 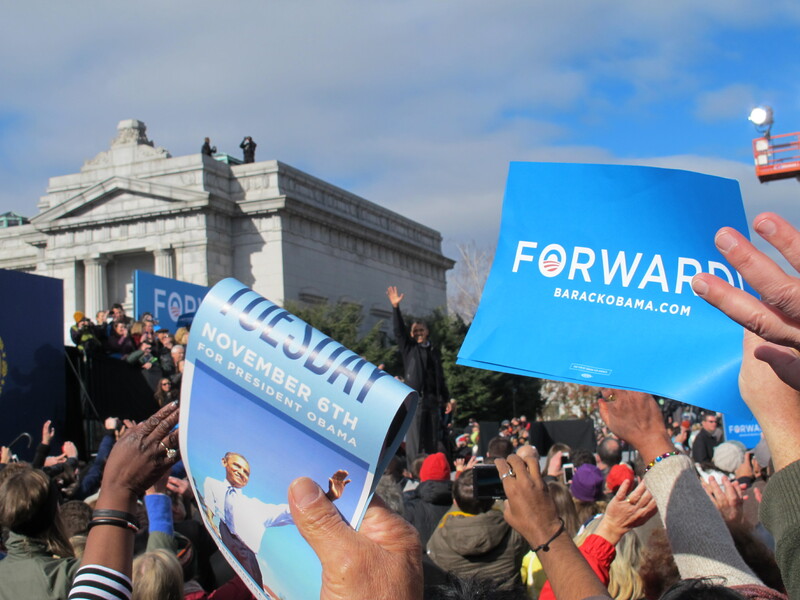 Hope to see you on the campaign trail! He may look like he’s running for class president, but he’s the real deal – Carl Sciortino is going to be great for our Commonwealth and our country. Vote for him on October 15! Last night, I got to hold my best friend’s hand as we watched the election results come in and victories unfold around us. For students and sick kids. For working mothers who deserve equal pay. For people who believe in a better future for this country. For a renewed vision for tomorrow. When my great grandmother came to this country in the early days of the last century, she never would have imagined the scene I saw last night. 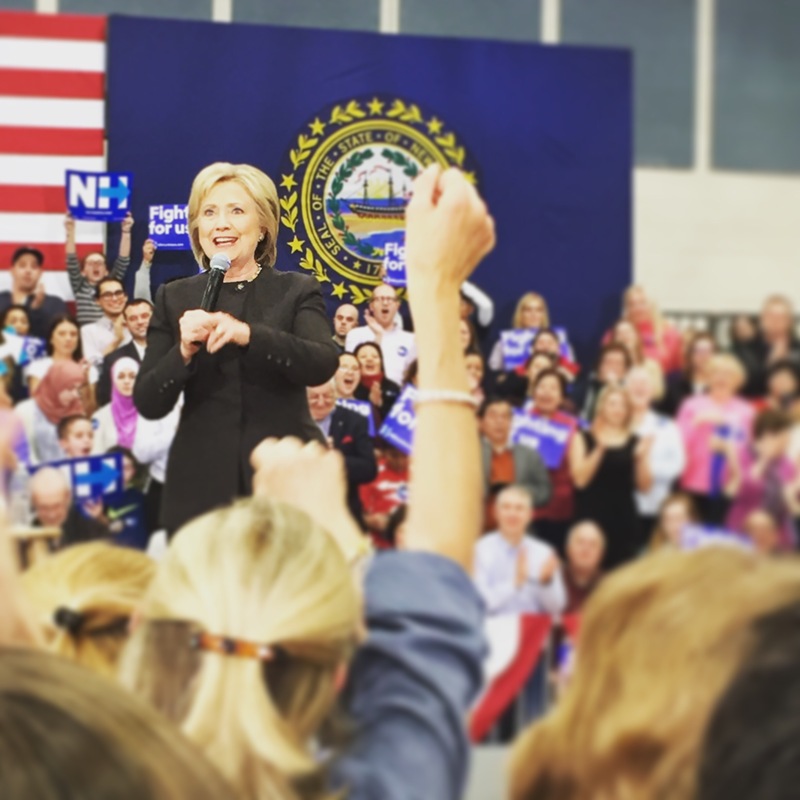 In my home state of New Hampshire, women now make up the entire Congressional delegation, and we’ve elected an amazing woman to serve as our second female governor AND made history with the first female Senator from MA. She, who fought for an end to segregation and was there when Martin Luther King, Jr. shared his dream, would have wept to see the spread of justice in the form of victories for marriage equality. She would have been stunned into silence at the idea of a black man not just winning the presidency, but doing it twice. And she, who trained her son who trained his daughter who trained her daughter – me – to stand up for what you believe in would have been right beside me all weekend as I phone banked, canvassed, and waited in the cold for two hours to cast my ballot for amazing candidates. From the state rep races in Michigan (congrats Dian!) to marriage equality in Maine to NH swinging blue to record-high turnout and people waiting in lines for hours just to do their civic duty, it was a night to remember. I am so proud of our victories last night – and I’m so excited to see what amazing things we’re going to do in the years ahead. Three points to anyone who gets that. It’s here. FINALLY. For better or worse, we’re picking a President today – and more. In New Hampshire, we might end up with an all-female delegation – two Senators, two Representatives, and a Governor, held by women. Can you even imagine how cool that would be?? The odds are in the favor of us Democrats, as you can see in this chart (which is definitely the only reason I was able to sleep last night). But when the ballots are in, how will you know if we’ve truly won? Check out this amazing guide my coworker forwarded on to the rest of us political nerds (thanks Ezra!). I, for one, am looking forward to an amazing night. I spent 2008 exhausting myself on a State Rep race in Michigan, and we brought home a victory only after the thousands of absentee votes were counted. In the rush of taking care of my awesome candidate, I didn’t get to truly celebrate the historic moment in the Presidential race. So tonight, I’m looking for a redo. I’m looking to be able to throw up my arms and cheer at the top of my lungs as they proudly announce that we’ve reelected Barack Obama. See you on the other side, friends. 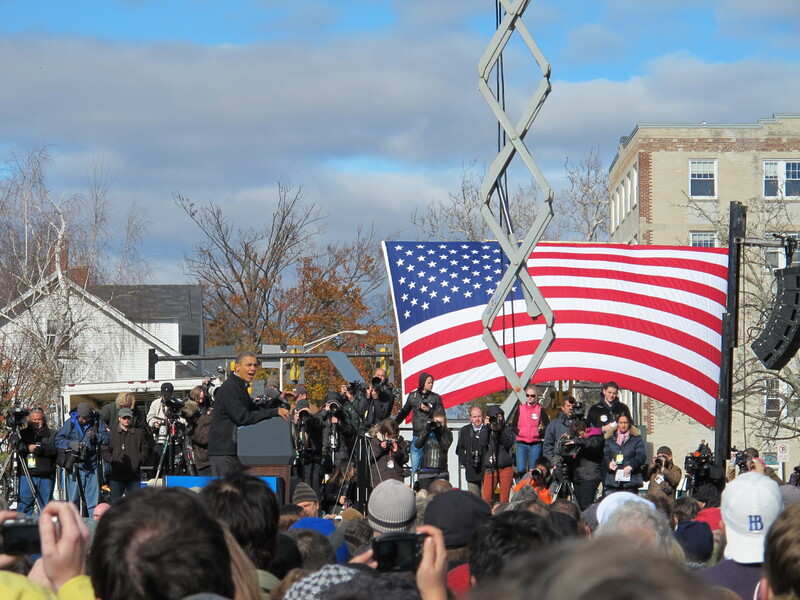 I was one of 14 thousand people who showed up to see POTUS and “OLD POTUS” (as my mom says) in Concord New Hampshire yesterday. Five hours in the cold gave us plenty of time to think about tomorrow and what’s actually at stake in this election – healthcare, equality, women’s rights to make decisions about their own bodies, climate change, and more. So while I know the ads are getting annoying… we’re tired of people knocking on our doors… you can’t stand to see another poll or political pin… just remember what’s on the line. And don’t stop thinking about tomorrow – and then DO remember to vote tomorrow. The future of our entire planet could depend on it. 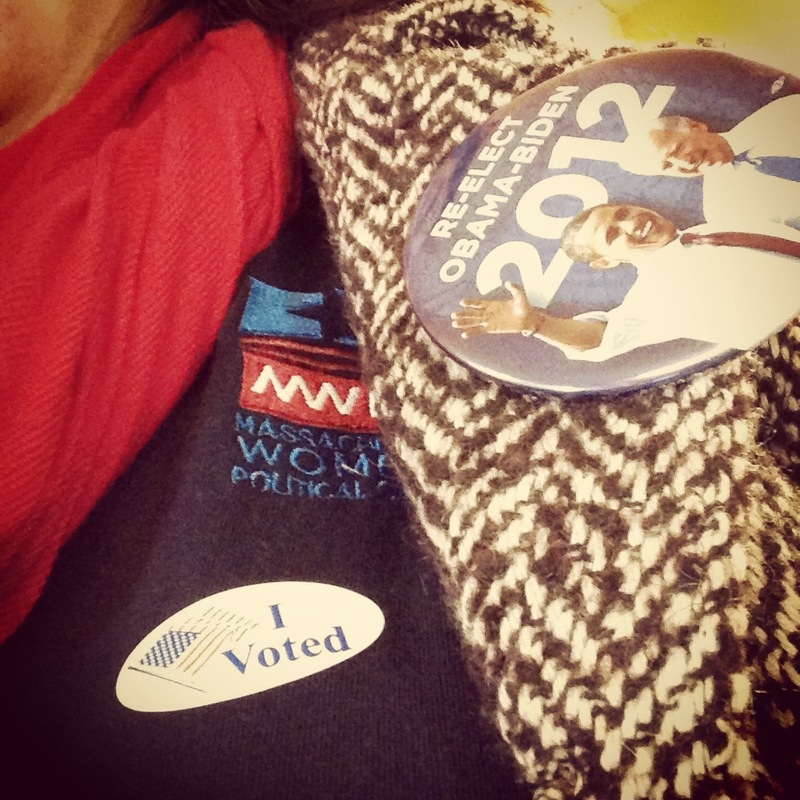 Still not sure where to cast your ballot? Click here to find out! I know who I’m voting for next Tuesday. I’ve known for a long time – even before the state primaries. 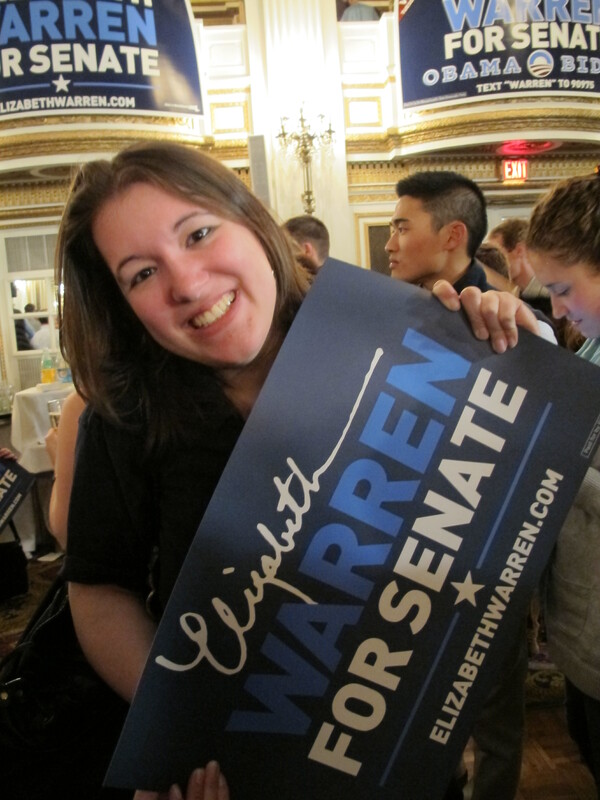 I am passionate about politics because I’ve seen how it can have an impact – positive and negative – on my life. There’s nothing wrong with being an undecided voter. There IS something wrong with not voting. Whoever wins on Tuesday will get to shape your town/ state/ country’s future, and it’s up to you to weigh in – even if you end up having to write in a name. But if you’re still struggling because it’s hard to get beyond the talking points and tell who really believes in the same things as you, I feel you. However, there are sites out there that will show you how people in office have voted, how candidates have filled out surveys, and what you can expect from people if they win on November 6. Think about what issues are important in your life, and then find the candidate that matches your priorities – chances are, one is better than the other. If you care about a woman’s right to choose, check out the NARAL Pro-Choice America Voter Guide. No matter where you fall on the issue, the facts about records and statements are here. If you care about food politics, look at this Food Policy Action voter guide. You can see a lifetime score for current officials to help you understand how they vote on issues like ending domestic and global hunger, fighting for humane treatment of farm animals, etc. If you care about the environment, check out the League of Conservation Voters Environmental Scorecard – one of the best scorecards out there with tons of information about who is standing up for our air, water, and earth… and who is not. If you care about civil liberties, head over to the ACLU to check out their scorecard regarding key votes. If you care about labor issues, see who AFSCME has endorsed for their stance of this topic. If you care about health and financial security, look at AARP’s collection of candidates’ stances in their own words. What other scorecards to you use to determine who gets your vote? Still don’t like what you see? Then I hope to see your name on the ballot next time!